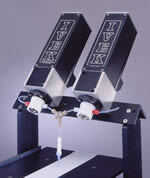 IVEK’s Digifeeder 2002 provides continuous quantitative, uninterrupted, pulse free liquid dispensing and metering. All operational parameters on the Digifeeder 2002 are programmed through an RS232 interface. Total electronic control allows for effortless, exacting calibration and full accountability of cumulative volumes dispensed. Software contained in the system’s master circuit board coordinates the operation of two linear dispensing channels to produce a precisely alternating dispense operation which will result in continuous fluid flow. All volume and rate commands for the Digifeeder 2002 use steps or steps per second where one step is equal to the displacement resolution of the pump head size in use. Range of continuous output is 0.14µl/second to 500µl/second.